BETHLEHEM (Ma’an) — A bill preventing supporters of the Boycott, Divestment, and Sanctions (BDS) movement from entering Israel was authorized on Monday for its first reading in the Israeli parliament, according to Israeli media. According to the Jerusalem Post, the interior committee of the Knesset, Israel’s parliament, approved the bill, which was initiated by Knesset Member Yinon Magal from the ultranationalist Home Party, paving the way for the bill to enter its first reading in the Israeli Knesset. The bill would allow individuals supporting a boycott against Israel to be banned from entering the country. The BDS movement was founded in July 2005 by a swath of Palestinian civil society as a peaceful movement to restore Palestinian rights in accordance with international law through strategies of boycotting Israeli products and cultural institutions, divesting from companies complicit in violations against Palestinians, and implementing state sanctions against the Israeli government. 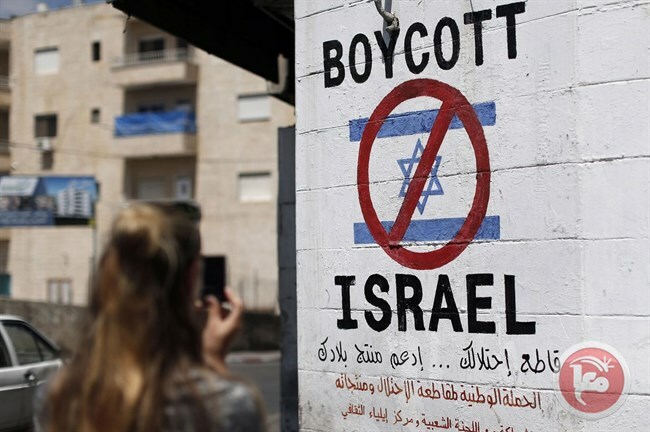 The move came after several months of Israeli efforts to crack down on the BDS Movement. Israeli Minister of the Interior Aryeh Deri and Minister of Public Security Gilad Erdan announced in August that they were forming a joint task force to “expel and ban the entry of BDS activists” into Israel and the occupied Palestinian territory. “Fighting against Israeli boycotts starts by fighting those who undermine the state of Israel,” Deri also said at the time. Without citing any names, the statement estimated that “hundreds” of pro-Palestinian activists and dozens of organizations were currently in Israel “to gather information and use it to boycott Israel, and harm its citizens,” and that the task force would also try to prevent the entrance of activists in the future. The statement also alleged that BDS activists traveled to the occupied West Bank and East Jerusalem to “incite” Palestinians. The announcement led to outcry from groups like the International Solidarity Movement (ISM), which believed they were the targets of the newly-formed task force. “Isolation of Palestinians by denying access and/or deporting human rights activists aims to make Palestinian communities already vulnerable and suffering from abuse…even more vulnerable,” ISM said in a statement in response to the plans of forming the task force. ISM argued that its foreign activists play a crucial role in trying to prevent Israeli army violence against Palestinians. “As a civilian population living under military occupation Palestinians in the occupied territories are promised protection under International law,” the group said in its statement. “(Foreign) civilians have been attempting to fill in the gap created by the failure of governments and official international bodies to provide protection and fulfill their obligations. The boycott, divestment, and sanctions (BDS) movement against Israel has gained momentum over the past year, with activists targeting companies that act in compliance with Israel’s illegal occupation of East Jerusalem and the West Bank. The Israeli government, meanwhile, has grown increasingly concerned about the growth of the BDS movement, as the movement’s support base has expanded to include companies, universities and religious institutions around the world divesting from organizations complicit in Israel’s violation of Palestinian rights. In January, the Israeli Knesset held a conference to discuss ways to combat BDS, and dedicated 100 million shekels ($26 million) of the government’s 2016 budget to the issue. More recently, Israel’s Parliament, the Knesset, passed a controversial NGO “transparency bill” into law on July 12, compelling organizations to reveal their sources of funding if more than half came from public foreign entities — a law which human rights groups and opposition Knesset members condemned for seeking to “silence criticism” of Israel and delegitimize left-wing groups.